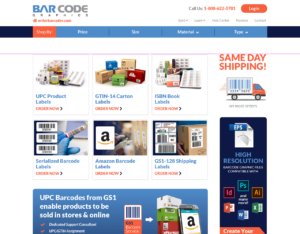 Bar Code Graphics’ client label portal; www.orderbarcodes.com has been updated with a fresh new look and added functionality. In addition to a much more user-friendly experience, we’ve streamlined label ordering, and added a Data Import Function (beta). The Data Import Function enables clients to provide us with spreadsheets with barcode data and descriptions and have us import them directly into an online order. Orderbarcodes.com is the easiest, quickest way to order printed barcode labels for immediate shipping. Our online portal enables users to place barcode label orders for more than 50 STOCK label sizes in 4 different material types. Most orders ship the SAME DAY they are placed.